Um noch einfacher Ornamente erstellen zu können, als mit den gelaserten Girih-Kacheln habe ich mich dazu entschieden, ein spezialisiertes Programm dafür schreiben. Physische Kacheln neigen dazu sich beim Loslassen oder beim Hinzufügen von neuen Teilen etwas zu bewegen. Lose Teile können nicht dauerhaft als Ornament aufbewahrt werden. Die Anzahl von physischen Teilen ist begrenzt. Das Aussehen von und Größe von physischen Teilen ist fest. Physischen Kacheln können nicht nahtlos aneinander gefügt werden. Version 2.2 vom September 2018. Diese App ist komplett in Swift geschrieben. Zusätzlich zu den Standard Girih-Kacheln: Zehneck, Fünfeck, Sechseck, Fliege and Rhombus habe ich weitere Formen hinzugefügt. Nicht alle diese Formen können lückenlos miteinander kombiniert werden. So kann die App auch verwendet werden, um Penrose-Muster oder Ornamente aus regelmäßigen Polygonen zu erstellen. Bitte lass mich wissen was du an meiner Girih App magst und was nicht. I have not started a Girih App for iOS yet. I still have so many plans to enhance the Mac version further, so that I am focussing on the Mac at the moment. The Mac App is already written in a way that you can work mostly just with one hand, so creating an iOS App should be possible. macOS 10.11 should work fine. Try to download it with Safari. Safari will unzip it automatically by moving the zip file into the trash folder and and leaving the App in the download folder. Is there a mailing list so we can subscribe to updates? I tried disabling Gatekeeper but I still get the error. When I checked this version again today, with macOS 10.13.2 I could not start it also. The OS told me, that “Girih.app” could not be opened. In this dialog was a small button with a question mark, which told me the app was signed by a verified developer, but the certificate was revoked. Since 2017 Xcode seems sometimes to automatically renew developer certificates. So I uploaded Girih.app 1.6 again, compiled with a newer Xcode and with a new valid code signature. I just downloaded and launched it successfully. Very nice app! I’m going to try using it to create designs for laser cutting. Thanks! The Girih App is now officially available in the Mac App Store. So it is now much easier to install and to get updates. Do you have a version of your app for OSX 10.9 (maybe one of first versions will be compatible?). I can’t upgrade to new os because work with many old discontinued software and don’t want to lose them. But features of your app look great and I really hope to work with. I’m ready to buy it for actual price if it will be compatible. Thanks. I send you an answer via e-mail. but I really like to have your software, Would you please give me a version. thank you for your creative mind. Hello, im exploring the app, i see some images in the appstore and it looks grat, but i have some questions, is possible to make patterns with a 3d effect, i mean theres a pattern, and then i want to put it in a 3d polygon to make a shadow effect, because i only find the pattern options but i didnt see how to use that patterns in a 3d figure, like the images in the appstore, if you can please help me. At the moment the Girih App has no 3D option. I experimented a while ago with 3D, but it did slow down the app, so I switched it off again. So at the moment only exporting the pattern as SVG and try to import it into a 3D software might help you. I was also thinking about exporting the pattern as file for 3D software could be helpful. What kind of export would be helpful for you? I was thinking about supporting POV-Ray, which I used a lot myself a while ago. First of all congratulations for you software. I like it very much. I would like to know if you can think about adding a Right Rectangle in your next update. I like to design origami paper bow-tie and other things and is impossible to do it with the big amount of figure you provide. I suppose you need a right triangle since rectangles can be build by grouping squares. 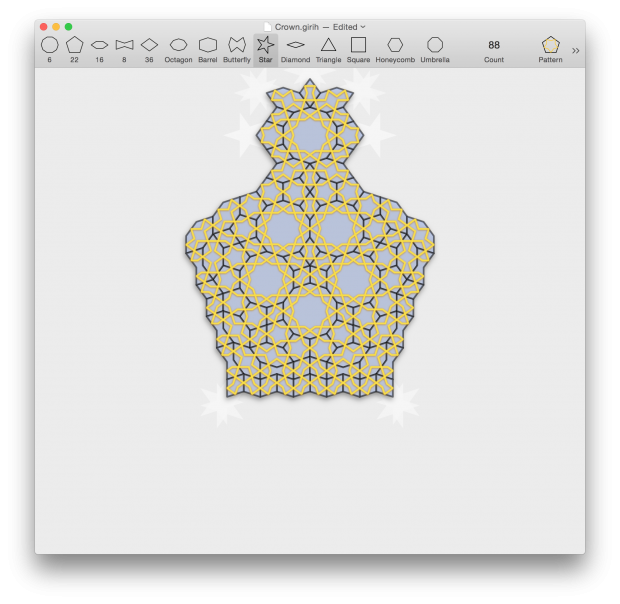 The current version of the Girih App is build upon equilateral polygons, which allow me to do some internal calculations very precisely. And all angles are rational. A right triangle has an irrational side length with the square root of two. When joining shapes, shapes can be scaled up or down. Shapes can only joined at sides of equal length. What option would you prefer? Option 1 leads to fractals and numerical precision problems when calculating overlaps. Shapes with different scale and constant border width tend to look ugly and the shape can get smaller than the border width, which is also problematic. I tested it a while ago and I was never satisfied with the results. Option 2 disallows placing most of the shapes. So maybe many shapes have to be added as connector pieces. Finding the right shapes will get more and more complicated. 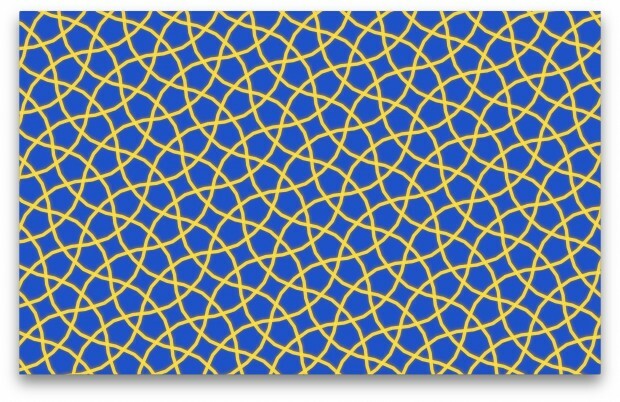 I think a compromise could be to start a new similar app which is not based on Girih tiles, but on based on Zellige of course including the right triangle. Thanks for your fast answer and for the description. As you explain both solutions could cause some problems. Therefore if you decide to create a new app based on Zellige I’ll purchase it for sure. A few days ago I published the Zellige App. Where from can I get the ready-made TriBallGrey.girih ? 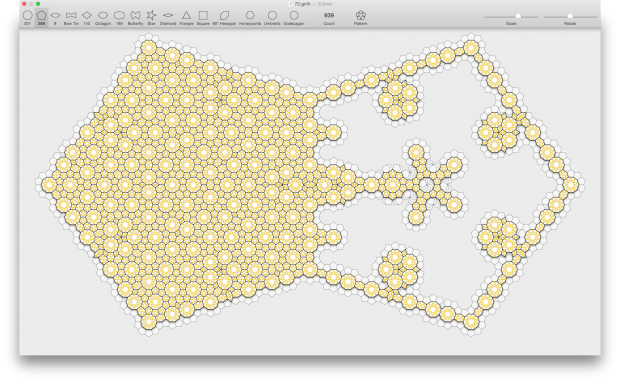 I will include it in the examples of the next version of the Girih App. Very kind of you, dear Stefan. The Girih App version 2.3 is available for download from the Apple App Store today. It includes the TriBallGrey.girih example file. I am interested in your Girih and Zellige apps. If I do purchase them and create images can I use the SVG files for commercial purposes? I’m thinking of digital images and adapting for paper cutting files. Many thanks – they look so much fun! You can use your designs for commercial purposes. That is great news – app store here I come……. I am looking forward to seeing what you are creating with this app. Just trying both of them out! Any suggestions on learning how to use them? I suppose – just play….. I have added now some videos how the apps could be used. And then carefully read the text in the help menu of the apps. For further questions just ask. The apps are intended to be as easy as puzzling with physical tiles. One click to add a tile. One drag to copy, cut or delete tiles. I wish I had read the Help files straight away. I initially tried to place any type of shapes to infill areas which did not “connect”. However, I followed your first video as a guide and have had fun making a lacy design by adjusting angles and borders etc. Time to sleep and have another go tomorrow. Another good way to start with is the examples menu.